"Oh, that’s a beautiful picture. 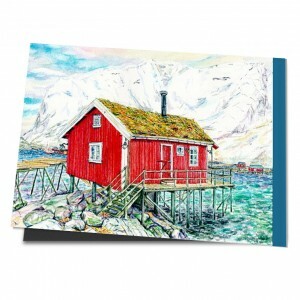 A typical Swedish house," said a customer of mine, enjoying my motif depicting a fishing hut – actually painted in Norway! It stands on high wooden planks 300 kilometres north of the Arctic Circle in a bay of the Lofoten archipelago. The hut, painted in bright red, is not really a fishing hut, but a modern holiday home with kitchen, living room, comfortable bunk bed and a small terrace. A few years ago, it was our home for a week in the middle of February. There was water all around us, in which at this time of year there were millions of cods from the Arctic Ocean coming to spawn. In front of us the pointed and steeply rising snow-covered mountains and above us this gigantic sky, which does not darken in summer and hardly brightens in winter. ''Pictures are never objective," I thought, while packing her self-proclaimed 'Swedish house' for my client. "But they inspire us. Each in a different way." When I look at this motif, for example, my thoughts immediately fly over the mountain range to the coast to a long, crescent-shaped beach. It is night and the aurora borealis chases colourfully over the black dome of the sky. Sometimes it shoots up like a gigantic column of light, sometimes it stretches and spreads wide, slowly, almost as if in slow motion, just to rush away again in the wild dance. I stand on a small hill and see dark silhouettes in front of me in the undulating sea. Two surfers on their boards. Sometimes sitting, sometimes standing – alone in this natural spectacle. I am the observer of a scene which I never saw with my own eyes, but which our landlady had told me about. Two young men had stayed a whole winter on this lonely beach. They slept in sleeping bags in rain barrels, fed on food that they fetched on foot once a week from a distant village. And sat, I imagined, otherwise on the beach, surfing the sea, being enchanted by the aurora borealis. Thanks to the Gulf Stream it is also relatively mild on the Lofoten Islands in winter. But the darkness must have been omnipresent.